The trio of Ken Carson, Raymond Courtney (aka Joe “Curley” Bradley) and Jack Ross met in the 1930s when they worked with the Beverly Hill Billies in California. The Ranch Boys trio lasted for seven years, working for a time on the very popular Tom Mix radio series, which helped them establish a national reputation and fan base, but the trio dissolved in 1941 when Curley Bradley was offered a job in the role of Tom Mix on the radio. The following year, Ken Carson joined the Sons of the Pioneers, but re-issues of their recordings kept the work of the Ranch Boys before the public long after the group broke up. Their work with Gene Autry in his 1939 film, “In Old Monterey,” resulted in a large following among members of the Gene Autry fan club. In the film, the trio sings “Tumbling Tumbleweeds” in ¾ time. They had recorded “Tumbling Tumbleweeds” for Decca in Chicago on Sept. 7, 1934, one month after the Sons of the Pioneers recorded their initial version for Decca in August, 1934, in Los Angeles, but Decca released the Ranch Boys’ record first, on Oct. 9th, so it became the first commercial release of that Western classic. They had a smooth vocal blend, accompanied by Bradley’s acoustic guitar. 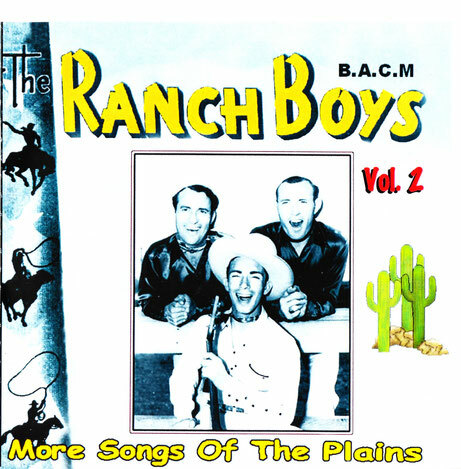 Six of their Decca recordings are featured on this second BACM release, as are 11 Thesaurus transcriptions and 11 air checks from their 1930’s “Pinto Pete & his Ranch Boys” radio show. One of the most interesting things about this disc is that each member of the group can be heard singing solos, and they are identified in the track list. Earlier CD releases featured only one unidentified soloist. You’ll hear versions of classics composed by Vincent & Howard, Curly Fletcher, Carson J. Robison, Fleming Allan, etc. A nice addition to any Western library. Contact VenerableMusic.com or phone (678) 232- 0268.